If you're near Cebu or Leyte and would like to get away from work for a few days, Pilar of Camotes Islands in Cebu is the perfect place to visit. 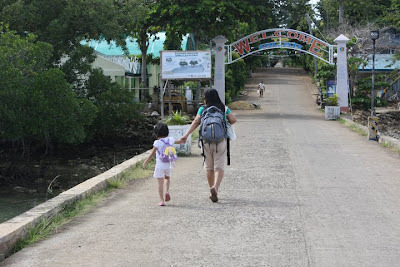 It's the other side of Camotes Islands that's not very popular among local and foreign tourists. And because the island is not overcrowded, you may enjoy the beach (or the countryside) all by yourself. We went to Pilar on Christmas Day. It was a spur-of-the-moment decision: after having breakfast, my husband and I decided to have a two-day trip to Pilar. We stuffed our backpacks with the most basic things and off we went to Ormoc City, Leyte to catch the 9:00 A.M. boat. We later learned that there were no boats leaving for Pilar that day. We took a multicab from Ormoc to Merida and from there we hired a pump boat that brought us to the island. Go around the place and experience rural life. If you're the adventurous type, you might want to chase the chickens when you see them on the streets of Pilar. It's something you might enjoy, especially if you're from the city. Seriously, it's comforting to walk freely on the streets of this island town. When you're here, you forget about pollution and traffic -- you just commune with nature. The Local Government Unit (LGU) of Pilar is promoting the place as a destination for educational trips rather than as a plain tourism spot. We went around the area on a motorbike and we were able to see some of the various activities done by its residents. Left photo: Magtalisay (Terminalia spp.) seedlings grown by the members of CaRFA (Can-ugkay Rainforestation Farmers Association) in their nursery in Brgy. Villahermosa, Pilar, Camotes. CaRFA is registered with the Department of Labor and Employment and is accredited by the LGU as a seedling producer organization. Unfortunately, I was not able to visit Pilar's municipal marine park (I will... next time). The marine park is one of the many highlights of the place. The municipality got the Most Outstanding Marine Protected Area of the Philippines award from the MPA Support Network (MSN) and its partners in 2009. Meet the locals and hear their stories. We were lucky to have witnessed two Christmas parties during our visit. Rest, relax, and savor the beauty of the place. This is the reason why I wasn't able to fully explore the island. I was resting and relaxing and savoring the experience of being stress-free even just for a day or two. Next time you plan for your company's team building, consider holding it on the island of Pilar, the place that personifies peace and tranquility.